Looking for ladies who are beginning in the modelling industry and want to build up/expand their portfolio. Very heavy glam looks will be created so will be something unique and interesting to add to your portfolio You will be getting FREE hair and makeup and edited pictures to use. 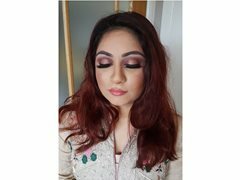 I am an experienced hair and makeup artist looking to experiment and create new vibrant glam makeup looks to update my own portfolio. Models will be provided with pictures and promoted through my social media. Models can be of ANY race. Must have good skin and medium to long hair. Focus will be on head shots only. Station is 5 mins away. I can provide train expenses. Refreshments and snacks will be provided. 1 or 2 looks created.